Helping job seekers land a job with the government. Federal, state, and local government agencies are hiring and have thousands of job openings across the country, posted on USAJobs.gov and local government jobs sites. This Jobs API allows you to tap into a list of current jobs openings with the government. Jobs are searchable by keyword, location, agency, schedule, or any combination of these. This API is great for job websites or applications, job banks, and career counseling and placement applications. The current default version of the API is v3. To explicitly specify an older version of the API, see the Jobs API code documentation. This Jobs API accepts a GET request. Jobs are searchable by keyword, location, agency, schedule, or any combination of these. Attempts to extract as much “signal” as possible from the input text. Handles word variants, so a search on “nursing jobs” will find a job titled “nurse practitioner” and “RN.” When parts of the query parameter are used to search against the position title, the results are ordered by relevance. When no query parameter is specified, they are ordered by date with the most recent listed first. For generic jobs searches (e.g., ‘jobs’, ‘internships’) where the lat_lon parameter is passed in, the results will be sorted by distance to the searcher’s geographic location. A comma-separated string specifying which federal, state, or local agencies to use as a filter. For federal agencies, the ID is based on USAJobs’ agency schema. Two letter codes are used to span entire departments, while four letter codes are generally used for independent agencies or agencies within a department. For state and local agencies, a sample of the format follows. If you specify organization_ids in your API call but the searcher types in another agency, the searchers’ agency overrides the organization_ids parameter. For example, VA jobs are returned when you specify Air Force jobs, but the searcher looks for jobs at the VA (https://jobs.search.gov/jobs/search.json?query=jobs+at+the+va&organization_ids=AF). No highlighting is included by default. Use ‘hl=1’ to highlight terms in the position title that match terms in the user’s search. Highlighted terms are surrounded with <em> tags. Specifies how many results are returned (up to 100 at a time). A comma-separated string specifying the level of government. Current tags are federal, state, county, and city. To get federal and state listings, you would pass in federal,state for the tags parameter. Comma-separated pair denoting the position of the searcher looking for a job. For example, ‘lat_lon=37.783333,-122.416667’ is the value for San Francisco, CA. For generic job searches (e.g., ‘jobs’, ‘internships’) where this parameter is passed in, the Jobs API server will sort jobs results and return those that are closest to the searcher’s location. For jobs that have multiple locations associated with the position, the distance to the closest location is used to determine the overall geo-distance for the job. Note that for keyword-based job searches (e.g., ‘jobs in NY’, ‘nursing jobs’), this parameter has no effect and is ignored. We’ve tailored this Jobs API for our use in our search results. Data are normalized across government job listings and we don’t include all jobs from all data sources. So, we encourage you to use the original data sources directly. Federal government jobs are from USAJobs. The USAJobs API for job opportunity announcements is at https://data.usajobs.gov/Rest. State and local government jobs are from cities, counties, and state agencies that use NeoGov (External link), such as jobs with the the city of Boulder, Colorado. Are we missing your jobs data? Email us at search@support.digitalgov.gov to let us know where you publish the jobs data for your federal, state, or local government agency. We’ll accept your jobs data via FTP or any machine-readable format (such as an RSS feed or API). Below is a sample JSON response for https://jobs.search.gov/jobs/search.json?query=nursing+jobs+with+veterans+affairs+in+albany+ny. We “eat our own dog food” and use this Jobs API to display the job openings on the government websites that use Search.gov. 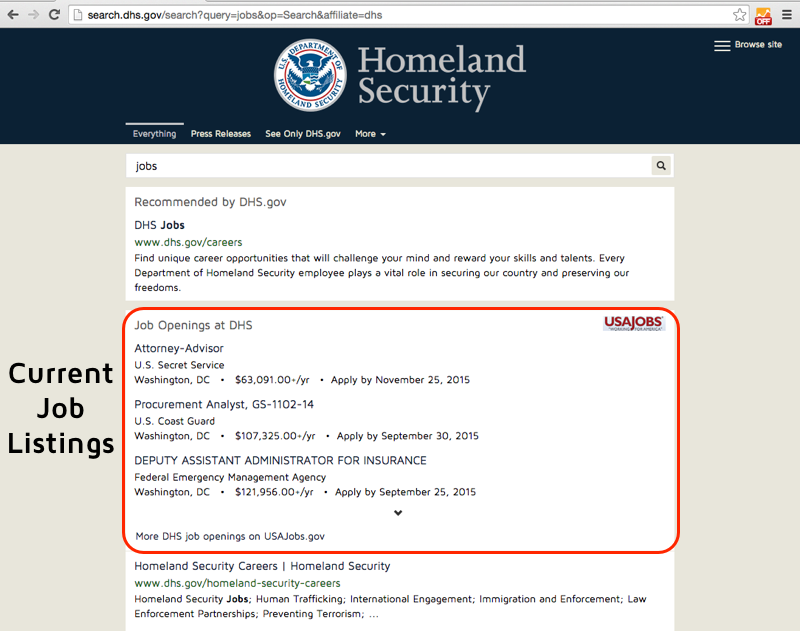 See the sample results page below that shows current jobs openings across the Department of Homeland Security for a search on jobs on DHS.gov. The server code that runs this API is on Github. If you’re a Rails developer, fork our Jobs Server API repo to add features (such as additional datasets) or fix bugs. Better yet, send us a pull request to contribute your changes to our project and improve this API for everyone who is using it. Email us at search@support.digitalgov.gov with any suggestions about what you’d like to see in the next version of API. By accessing the Jobs API, you agree to USA.gov’s Terms of Service for Developer Resources.